KDIPA participated in the 21st meeting of the Japanese-Kuwaiti Businessmen Committee on October 11, 2017. The meeting, held at the Kuwait Chamber of Commerce and Industry, brought together government officials and businessmen from various sectors of both economies. The meeting was co-chaired by Mr. Tarek Bader Al Mutawa, Board Member of the Kuwait Chamber of Commerce and Industry, from the Kuwaiti side of the Committee, and his Japanese counterpart Mr. Hiroshi Saito, under the patronage of Sheikh Dr. Meshal Jaber Al-Ahmed Al-Sabah, the Director General of KDIPA, with the presence of His Excellency Mr. Takashi Ashiki, Ambassador of Japan to the State of Kuwait, and Mr. Shinichi Kihara of the Ministry of Economy, Trade and Industry of Japan. The annual meeting provided a platform on which both countries were able to discuss their current economic conditions, exchange views on measures to promote economic relations, discuss smart communities in both countries, investment opportunities in Kuwait’s major infrastructure projects as well as cooperation in the field of renewable energy. KDIPA Director General gave the inauguration speech, followed by a presentation by Sheikh Abdullah Sabah Al-Sabah, Director of KDIPA’s One-Stop Shop Department, on incentives for investing in Kuwait. 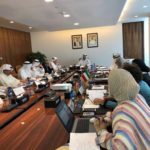 The Committee also heard from representatives from various governmental bodies in Kuwait, such as the Kuwait Authority for Partnership Projects, the Kuwait National Fund for SME Development, the Sabah Al-Ahmed Center for Giftedness and Creativity, the Public Institution for Housing Welfare and the Kuwait Institute for Scientific Research.